How to Make Better Use of Your Fitness Tracking Devices? The market for wearable fitness devices and health apps is growing rapidly. There are devices and tools that can track your calorie intake, the number of steps you take, calories you burn, and your quality of sleep. However, the effectiveness of these devices will depend entirely on the information you put in them. 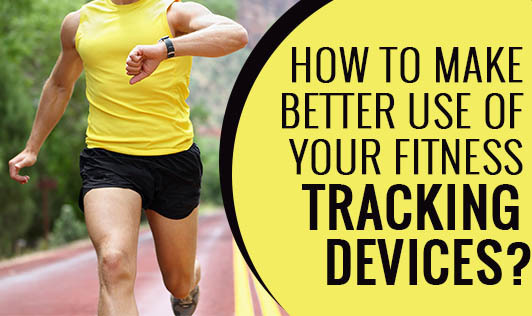 Here are a few tips that will help you get the best from tracking devices. Always Be Honest - Don't cheat when you input data as in your age, weight, daily food intake, or any other variables. The device will give you wrong results, when you feed in the wrong data. Wear it Regularly - The device should be the first thing you wear in the morning and the last thing you take off at night. Devices that measure sleep quality depending on how much you toss and turn needs to be worn through the night. Know the Difference - So what if you have been walking all day and completed your quota of 10,000 steps? That doesn't mean you are physically active. There is a difference between just moving around and actual exercise. Set Realistic Goals for Yourself - Set realistic goals while using the device. Your device may have a default goal of 10,000 steps. But if your baseline steps are very less, you can start with fewer steps and slowly build up. Choose the Right Device - Choose the right device depending on how active you are and the fitness goals you have in mind. If you are confused about choosing a device, consult your fitness expert to help you choose the right device for you, and above all make sure you use the device regularly to attain your goals.